Human beings are governed by rhythms. From our pulsing heartbeat, to the cadence of our speech patterns, to when we fall asleep and wake up—countless rhythms drive our existence. Perhaps this is why we are so mesmerized by music. “From lullabies to funeral songs, music is a part of our lives from the moment we enter the world, until the moment we leave it,” says Diane Snyder-Cowan, director of the Elisabeth Prentiss Bereavement Center for Hospice of the Western Reserve. She describes a phenomenon called, “entrainment,” whereby people’s biological rhythms become synchronized with the music they’re listening to. Entrainment exerts such a powerful force that simply listening to and focusing on soothing music can actually help a person enter a more relaxed state of physical and mental functioning. Once people enter this state, they’re better able to physically and mentally process things—from medications to emotions. A professional music therapist, Snyder-Cowan is part of a specially-trained group of care providers who use melodies to achieve a particular treatment goal. “Music therapy is all about the intentional use of music to bring about a particular change; whether that change is therapeutic, emotional or spiritual,” she says. Music therapists work in a variety of different settings, from hospitals to halfway houses. In some cases, music may even be more powerful than more traditional medical interventions, such as prescriptions and physical therapy. Singing helps the stroke-stricken to speak sooner: A study conducted on a group of Finnish stroke sufferers found that listening to their favorite tunes while recovering helped them regain their ability to recognize words and communicate. When compared to stroke sufferers who listened to audiobooks or nothing at all, those that listened to music for a few hours a day experienced a much faster recovery of their verbal skills. The music listeners were also less likely to be depressed and confused, two common post-stroke side effects. Pulsing pitches set pace for people with Parkinson’s: Numerous studies have indicated that music therapy can allow people with Parkinson’s to regain some of their overall functioning. In certain cases, music may even prove more effective at helping a Parkinson’s sufferer move better than traditional physical therapy techniques, according to an Italian study published in, “Psychosomatic Medicine: Journal of Biobehavioral Medicine.” Music therapy also upped the quality of life and overall feelings of happiness reported by those dealing with the disease. Classical compositions have calming cardiovascular effects: German researchers discovered that people recovering from open-heart surgery had lower levels of the stress hormone, cortisol, after listening to classical music. Relaxing refrains also helped patients calm down pre-surgery. In some cases, listening to music before an operation was more effective in getting a person to relax than commonly-prescribed anti-anxiety medications. Music therapists also work with hospice care providers to assist a dying person and his family as they go through the grieving process. Depending on the unique needs and wishes of the ailing individual and her family, a music therapist can perform services, such as helping to create a compilation CD of songs that have special meaning to the dying person to give as a legacy gift, composing a song about the person’s life, and selecting and playing particular melodies meant to ease their emotional and physical pain as they transition out of this life. 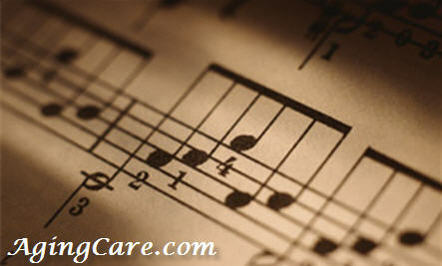 Healing Harmonies: Music as Medicine for Seniors and Caregivers originally appeared on AgingCare.com. Make your own music: If you or your loved one have a passion for playing a particular instrument, don’t hesitate to dust off the old six-string and strum out a few chords. “Live music has its own set of special rewards,” says Snyder-Cowan. Travel to another time or place: Music and memory are intimately intertwined. To help your loved one get in touch with their past, try playing music that was popular when they were in their 20s and 30s. Match tempo to temper: No one genre of music is more therapeutic than another. According to Snyder-Cowan, it’s all about personal preference. Pick songs that you and your loved one enjoy listening to. Keeping in mind the principal of entrainment, try to synchronize the songs to the mood you’re trying to invoke. Highlight hobbies: For example, a sick person may not be able to visit the opera like he used to, but that doesn’t mean he has to forgo his favorite arias. You can help bring the opera to him by purchasing or downloading some of his favorite performances and playing them. A documentary showed Parkinson's sufferers unable to walk, but they could dance! This was one way to continue to be mobile despite their disabilities. Even better, they could ride bicycles. Our brains are amazing organs! Music always cheers me up when I am depressed. Music has the ability to sooth a person in a way that words never will. Let the music carry you away. Music is organized sound, and what one likes varies according to type, character, personality. What one classes as "soothing" might be quite dull to another. The industrial sounds of a car engine or air conditioning unit, might be "music to one's ears" for others. Good to have confirmation of the benefits of music.